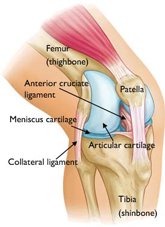 Many patients attending the clinic for knee pain do so without having suffered any direct injury to their knee. Sometimes their knee pain seems to have developed for no apparent reason. This is quite common. For example, you might be a runner who has started to get knee pain while running. You might even notice that the worst time is the day or two after the run. Even if you are not a runner, you might have noticed that your knee is sore when you get up first thing in the morning. Some of you might notice it when you go up or down stairs. Or it might become painful when you’ve been standing for a while. If this is the type of knee pain that you suffer from, then there is a strong likelihood that your knee may be slightly misaligned. In the vast majority of cases, this type of knee pain responds really well to physical therapy. However, if you are beyond retirement age, then arthritis is likely to be a factor in your knee pain. Although almost everyone over forty years of age will show some degree of arthritis or “wear and tear” in their knee joints, this usually only becomes a significant factor in pain from the sixties onwards.